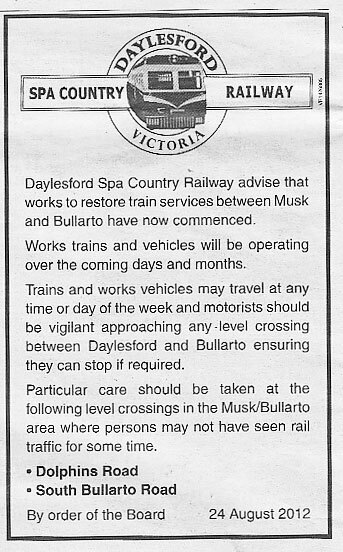 In one of the local newspaper's for this week - The Advocate 5th September - I noticed an article stating that the Daylesford Spa Country Railway was advising that works have commenced to restore train services between Musk and Bullarto. Please take note of this when traveling in this area over the next few weeks. Particular care should be taken at any of the rail crossings and please approach each with caution, in particular at the Dolphins Road and South Bullarto Road crossings. The Daylesford Spa Country Railway (which is operated by the Central Highlands Tourist Railway) is a volunteer-operated 1,600 mm (5 ft 3 in) broad gauge tourist railway located in Victoria, Australia. 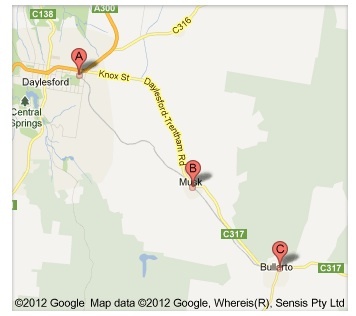 It operates on a section of the formerly disused and dismantled Daylesford line. It presently operates between Daylesford and the hamlet of Bullarto, although the section between Musk and Bullarto is currently closed due to bushfire damage sustained in early 2009 it is now in the process of being restored. Website for the Daylesford Spa Country Railway is HERE complete with all the information you may need when visiting the area.